I can get pretty angry with Pitchfork at times. It seems like it was only a few weeks ago that I was steaming angry about their hatchet job article about the cancelled HBO show Vinyl. In fairness, I am still really angry about that article (you can read my response by clicking HERE). 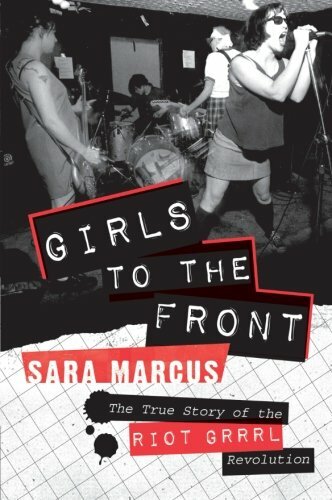 But today, Pitchfork went and "totally redeemed themselves" by publishing the following article called The Story of Feminist Punk in 33 Songs and it is GLORIOUS - You can read the article by clicking HERE. Just a few small complaints, but on the whole, a VERY good list. Jenn Pelly did a really great job along with the staff. 1. I think the list should have included The Avengers from San Francisco and their great singer Penelope Houston perhaps Siouxie & The Banshees as well (I mean they did play the 100 club Punk Festival. No need to remove or replace, 33 seems arbitrary anyway, just add. 2. I kind of feel odd about Bikini Kill, The Julie Ruin, and Le Tigre (all Kathleen Hanna projects) being included but not Heavens to Betsy. I mean maybe two KH projects, Sleater-Kinney, Bratmobile, and Heavens to Betsy? 3. Not sure how I feel about Hole. Live through this is a really good album, I remember thinking that at the time it came out (in shock). I dunno, maybe I should just shut up. Courtney Love is just tough for me to embrace. Probably unfair. Anyway, with those small caveats, so many favorites on the list. The Bags, Kleenex, Spitboy, X-Ray Spex, The Slits, Sleater-Kinney, Sonic Youth, The Raincoats, and L7. Plus pretty cool they included G.L.O.S.S and Downtown Boys too! I tip my cap to the fine folks at Pitchfork Media! What did you think of Pitchfork's list? Let me know, leave a comment!